What a difference a day makes; a day and 4 months plus if I’m honest. Last time I wrote here, I was so sunk into the gloom post-general election I’d actually turned to poetry! Friday morning, I set off on a train to Manchester, on my way to the AGM of my impairment group (the politics of that deserving its own blog! ), knowing many of my friends were ensconced outside parliament, urging MPs to vote against the Assisted Dying Bill. As the sun came out at my destination, so the news came through that the Bill had been defeated. I breathed a sigh of relief... My `journey’ as a disabled person in relation to Assisted Suicide, has not been straight-forward. It seemed to me way back, crassly as it feels now, that it was all about personal assistance choices; if someone wasn’t physically able to `top themselves’ then they should be able to direct someone to do that for them, by what-ever means. To say I had not thought this through is something of an under-statement! I didn’t think about who would do the final deed/ how they would feel/ what implications it would have for those who did not want to exercise this `right’. I was also not convinced that it was `About Us’ Disableys. Once I began to join up the dots however, I began to grasp the wider issues; it became clear that the main proponents of the Bill were not so much concerned with the pain and `suffering’ a terminally ill patient may endure in their last days but primarily, for their lack of autonomy; their dependence on others. That to me, smacked of judgement on my entire life. Of course I understand that being born with an impairment is a different experience from that of someone who acquires theirs. I often feel however, that I’m slightly patronised at times by others when viewed either as some sort of Higher Being, somehow able to endure a truly Orrible existence, being “Soo disabled”, or from the attitude of “Oh she doesn’t understand, Bless Er.. doesn’t know what she’s missing and actually, she’s a bit thick anyway”! Grasping those wider issues, is something I feel those that those proposing the Bill, have failed to do. Perhaps this Bill has called into question how we define a ‘right’ and as the saying goes, ‘with rights comes responsibilities’; what may appear best for an individual, may very well have dire consequences for others. It seems ironic that the majority of MPs who voted against Friday’s Bill are Tories, where their party policies seem designated to favour a few individuals over the plight of many. 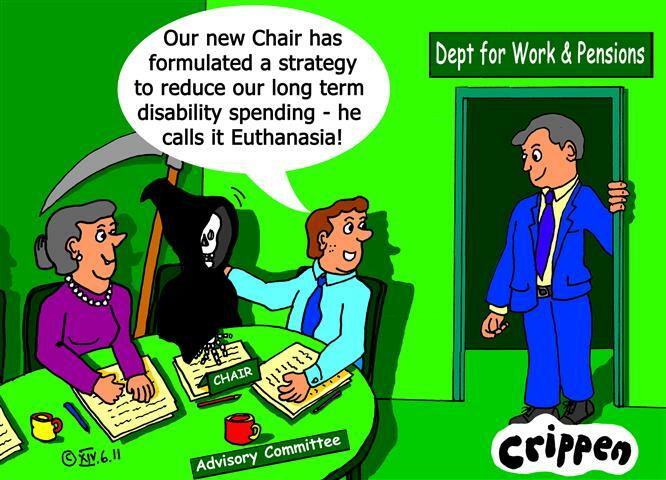 Right now I feel that those of us who resisted the Bill, need to put our `money where mouths are’ and lobby for better palliative care, support packages etc. That’s our responsibility for the right we have to live.